Biblestudybooksbyivy.com is a site providing books and study materials to aid the serious Bible student to study the Bible in such a way as to let the Bible interpret the Bible. 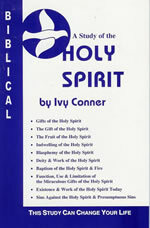 The Bible studies and personal development materials written by Ivy Conner are simple and easy to understand and always include scriptures so a person can make sure Ivy is teaching what the Bible teaches. Also available—various Bible versions and other reference books to help in your study of God’s word. Ivy Conner is the author of many items on this site. He has been studying God’s word and teaching, speaking and writing about the Bible for a lifetime. His Bible studies are clear and concise, and it is easy to check each point with the scripture. His personal development materials are Bible based and encourage each person to grow in every aspect of their life—spiritual as well as physical and material. Ivy has worked as a writer, speaker, trainer, radio talk show host and minister. He is known for his ability to condense and outline studies so they can be easily remembered and successfully used. Ivy has written extensively on Bible prophecy, success motivation, time and money matters; denominational doctrines and the cults as well as numerous other topics. You can count on true, dependable and clear teaching of God’s word from Ivy. We believe and teach the Bible and the Bible only is the word of God and believe it completely furnishes us with all truth necessary for salvation and a rich, full life, II Timothy 3:16-17; II Peter 1:3; Jude 3. God’s word is the truth, John 17:17 and Jesus, the Word is truth, John 14:6. We must believe that the truth makes us free and that we must continue in the truth to truly be Christ’s disciple, John 8:31-32. The Bible is our only and ultimate authority. We believe we must be doers of the word and not hearers only, James 1:22. What does it take to be doers of the word? Check out the following scriptures for starters: Ephesians 2:8-10; 4:1-6; John 3:3-5, 16, 36; Mark 16:15-16; Luke 13:3; Romans 10:8-10; Acts 2:38; 22:16; I Peter 3:20-21; II Peter 3:18; Rev. 2:10.